This crazy ‘public art’ installation was recently… ahem, erected, at Indian School Road and Marshall Way. Scottsdale Arts is a private business with a 20-year, no-bid city contract. It enjoys free rent in taxpayer-owned and taxpayer-maintained facilities. It shares none of its revenue back to the taxpayers. And it gets a $4+ million annual, taxpayer-funded subsidy, for which it’s contract contains ZERO objective performance metrics. 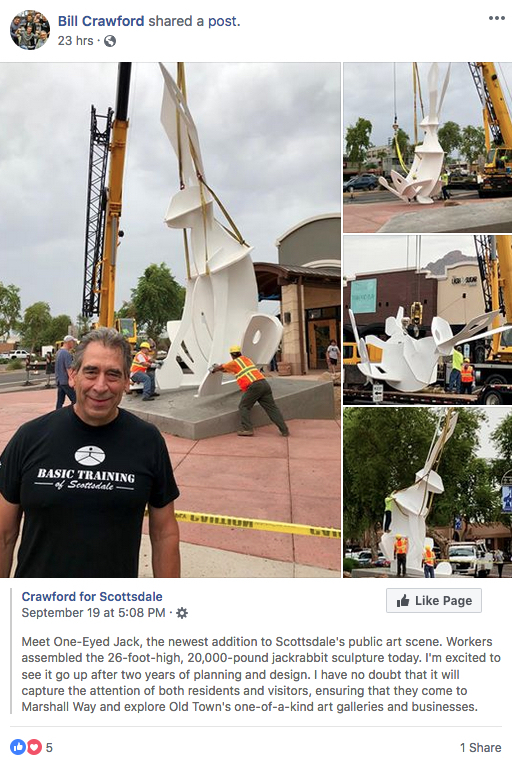 I previously assumed that the cost of this ‘art’ came out of Scottsdale Arts’ regular budget. But then I saw an email from Dan Semenchuk that indicated it came out of bed-tax money. I think the bed tax has turned into it’s own little scam and slush fund (with hundreds of thousands of dollars paid to the mayor’s campaign PR hack–Jason Rose–alone), but it’s ridiculous that it’s now been used to further subsidize the con artists that run Scottsdale Arts… including Diana Smith, the wife of city councilman (and former city treasurer) David Smith. I hope you’ll remember that Smith is campaigning to keep his seat, and a big part of his platform is asking you to further tax yourself (via Ballot Question 1) to repair our crumbling streets, bridges, and other infrastructure. My question is, why are we paying money for 3rd-grade cardboard cut-out ‘art’ instead of spending it on infrastructure? Furthermore, as the Phoenix New Times’ Lynn Trimble pointed out, only one council member voted against this project: Kathy Littlefield. That means that mayor Jim Lane voted for it, along with the aforementioned incumbent council member, David Smith (are you surprised? ), Suzanne Klapp, Virginia Korte, incumbent candidate Linda Milhaven (who is a Wells Fargo vice-president, and former board chair for Scottsdale Arts…surprise again), and our biggest recent disappointment, Guy Phillips. Let me reiterate: These folks voted to spend millions of dollars of YOUR tax money EVERY YEAR on this kind of pure crap, while simultaneously neglecting a billion dollars in debt (Scottsdale has the highest per-capita debt of any metro-area city) and well over a billion dollars’ worth of deferred infrastructure maintenance. And Jim Lane’s new bro-mance with Bill Crawford show’s Crawford would be more of the same… IF he can finally get elected. So, bottom line: Don’t vote for Bill Crawford, David Smith, or Linda Milhaven. Think you should mention how all of Crawford’s signs are all over Shawn Yari properties. Even posted on the inside window at the old Jared Jewelry location on Scottsdale/Camelback. If Yari is funding him and letting him put signs up, you should do an article on who do you think he is supporting when development issues are on be voted on by the Scottsdale City Council. That is an excellent point, Martin, thank you! I’ll do a follow-up soon. Who is the real JACKASS here? During Summer 2012, property and business owners along Marshall Way, concerned over the precipitous loss of pedestrian traffic along the once busy and sought after street, banded together to brainstorm a solution that might help turn the tide to increase business. Over 20 businesses formed the WE ARE MARSHALL association, from 5th and Wine by the Parks Horse Fountain, (one of the most photographed locations in the Valley) to Eddie’s House, where Blue Clover is today. Sadly, these businesses are closed, as well as many of the long standing Galleries that historically lined the street, many moving to Downtown Phoenix. The WAM association approached Scottsdale Arts, as well as the Mayors office and the Council, to see what assistance or guidance they could provide. After many group meetings, the focus turned to the creation/installation of a Public Arts piece that would exemplify the Contemporary Arts District of which Marshall Way has long been an anchor. Funding for the future creation WAS earmarked from the Bed Tax Fund, and a call for artists went out across the country. Through many starts and stops, we have the Sonoran Jack in Place. Will it help to gain increased pedestrian traffic to the area? We will have to wait and see, and are looking forward to the Thursday evening Art Walks that will soon begin again. My point is that you demonize the Council members who helped move this project forward, singling out Linda Milhaven as the Great Satin who is, in your opinion, to be voted out of her re-election bid. I for one will be giving her my VOTE and full throated support in the upcoming election. YOU don’t like the sculpture, and that is your right. A similar response was garnered when the Eiffel Tower made its debut. (I am NOT making an artistic comparison, but I hope YOU can appreciate someone else’s viewpoint. Lastly, you reference that Kathy Littlefield was the only council member to vote against the piece. That is CORRECT! However, her veto had NOTHING to do with the funding process, as that had been earmarked for the project over FIVE years ago. 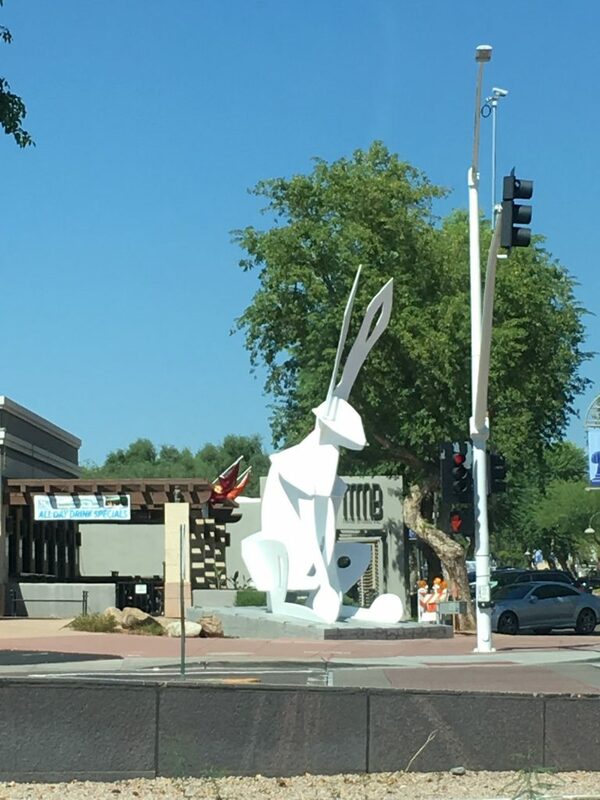 NO, her veto to the installation came because she didn’t like the piece, plain and simple, and in her words she boldly stated “There are no White Rabbits in nature”. Thanks for adding your perspective and a little history, Dan. It sounds like your main objection to my article was that I was “singling out Linda Milhaven.” There are millions of dollars’ worth of other reasons to not like and not vote for Linda Milhaven. This is probably one of the least objectionable city projects in which she’s been involved. Mainly I don’t like her because she’s dishonest and she’s far more concerned about her corporate owners than us peasants. But overall, this is a good illustration of one of the main issues with “public” art. If the “public” (which includes folks other than you and your neighboring businesses) is going to pay for it, then it should be quality work that appeals to… “the public” (not just you and your friends). You even made two of my points for me with your reference to Bob Parks’ Horse Fountain. Second, Bob Parks donated the Horse Fountain. I don’t know the details of the installation financing, but I can imagine that the City (meaning “the taxpayers”) paid for the installation and probably the street work (which serves a public purpose beyond the art). However, the point is that Parks invested his own money in the art. That’s more like the way “public art” should work, in my humble opinion. Not unlike Gustav Eiffel, who had considerable personal financial investment in ‘his’ Eiffel Tower. Anyone who would shill for Milhaven should not be trusted. Scottsdale City Council’s and development related departments have been corrupt for the 20+ years that I’ve been involved. The Scottsdale Chamber of Commerce has held a majority currently Lane, Klapp, Korte and Milhaven…a long time Chamber toady and executive with Wells Fargo Bank a consistent predatory and dishonest actor in the financial sector. Milhaven likely benefits financially from increased height and density zoning decisions over which she has influence to pedal. Next post: General Plan Update: The Best Bad Idea We Have?